Sitting at my desk at 6.50 am this morning, and seeing nothing but a black sky outside the window, and with the rain tap-dancing on the roof, I feel in need of cooking some comfort food today (in between helping Erik apply lining paper to our lounge walls). And what could be more comfortable than Soup? So I have been reminding myself of some of my favourites. Hope you like them. This Potato Soup is from Darina Allen, the amazing chef who started the Ballymaloe Cooking School in Ireland - I thought if she had a recipe for Potato Soup, it would be a very good one. If you haven't made your own chicken or vegetable stock, use low salt stock cubes or liquid, and keep tasting the soup. Also this is a good basic recipe to turn into a mixed vegetable soup - just add chopped carrots, parsnips, celery etc to turn it into a more filling meal. The amounts given serve 6, but if you are like me, I like to make a big batch and freeze the rest. 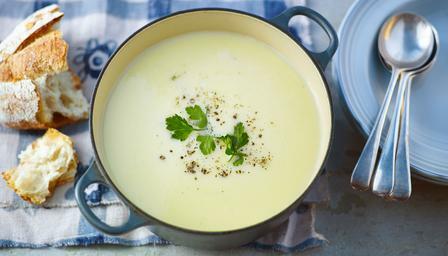 Hope you enjoy this Potato Soup - it really is Comfort Food for these cold days. Melt the butter in a heavy saucepan. When it foams, add the potatoes and onions and toss them in the butter until well coated. Sprinkle with salt and a few grinds of pepper. Cover with a butter wrapper or paper lid and the lid of the saucepan. Sweat on a gentle heat for approximately 10 minutes. Meanwhile, bring the stock to the boil. When the vegetables are soft but not coloured add the boiling stock and continue to cook for about 10 - 15 minutes or until the vegetables are soft. Add the milk and puree the soup in a blender or food processor. Taste and adjust the seasoning. Serve sprinkled with a few freshly chopped herbs, or some of the following garnishes. Croutons of bread, first fried in butter & oil with some pureed garlic. Parma Ham, either fried or roasted for a few minutes and crumbled into flakes. Caramelised shallots, gently fried until almost crispy.